Oh, Japan. I love how weird you can be. In case you’re following us on social media, you know that one-half of Huckleberry Travel is in Tokyo right now. (And if you’re not following us on social media, you can fix that by clicking on the icons in the header.) This is our first visit to Tokyo, actually, and I have to say, it’s absolutely incredible. In fact, I can’t wait to come back, hopefully with a group of Huckleberry Travelers! I’m sure I’ll be blogging about the phenomenal food I’ve eaten, the rich culture, and the lovely people I’ve met. But the thing, so far, that has been fun in the craziest way was my visit to Harajuku and Takeshita Street. This part of Tokyo is buzzing with all kinds of activity — and most of it is kinda weird. If you’re looking for a good cosplay shop, or you want to cuddle an owl, well, Harajuku is the place to let your freak flag fly. So, maybe you’ve heard about how Tokyo has cat cafés, where you can sit, have a drink, and be surrounded by cats? Well, that’s nothing compared to what they’ve got in Harajuku (though, there’s a cat café in Harajuku, as well). How about an Owl Cafe? Wait, what? Yes. A café where you can have a hot cup of coffee and cuddle with a terrifying bird of prey. 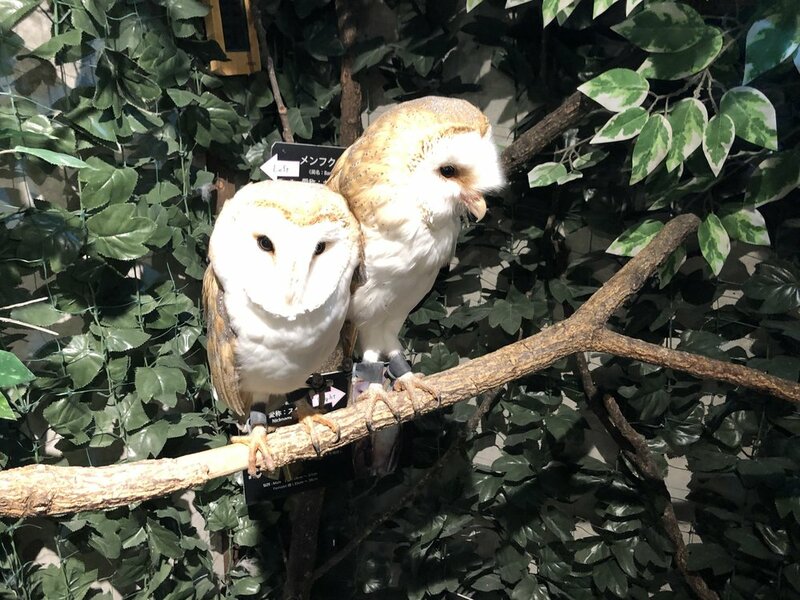 So, I walked from my hotel to Harajuku with the intention of going to Owl Village, but I got there much earlier than I expected, and they weren’t open. So, instead I wandered down the block and stumbled across … or stumbled over, really … some of the local characters. Like, for example, this woman, dressed up like a maid, dragging a teddy bear along side her, sucking from a baby’s bottle, and curling up in the middle of the street at random moments. Yeah. So, that happened, today. 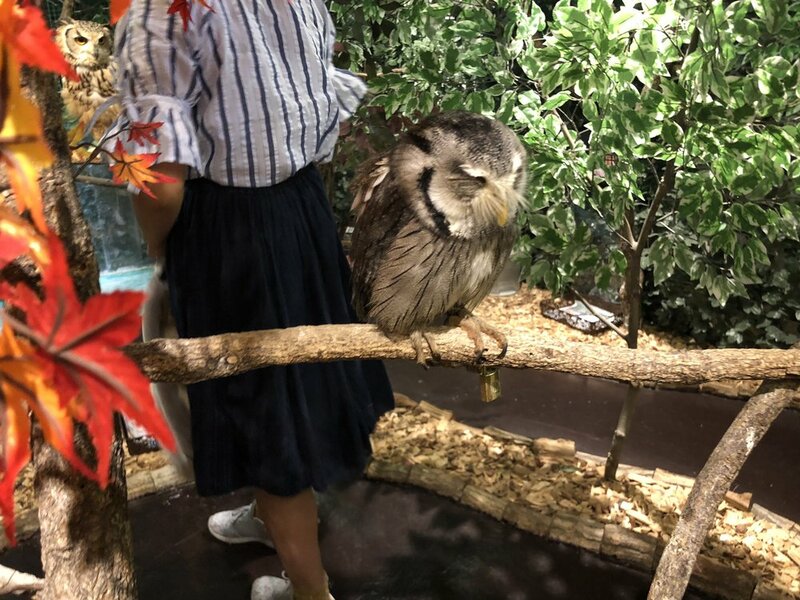 Anyway, as I was walking around, I discovered that there was a completely different owl-cuddling experience, right on Takeshita Street. So, I bought a ticket and went inside, and let me tell you…it did not disappoint. 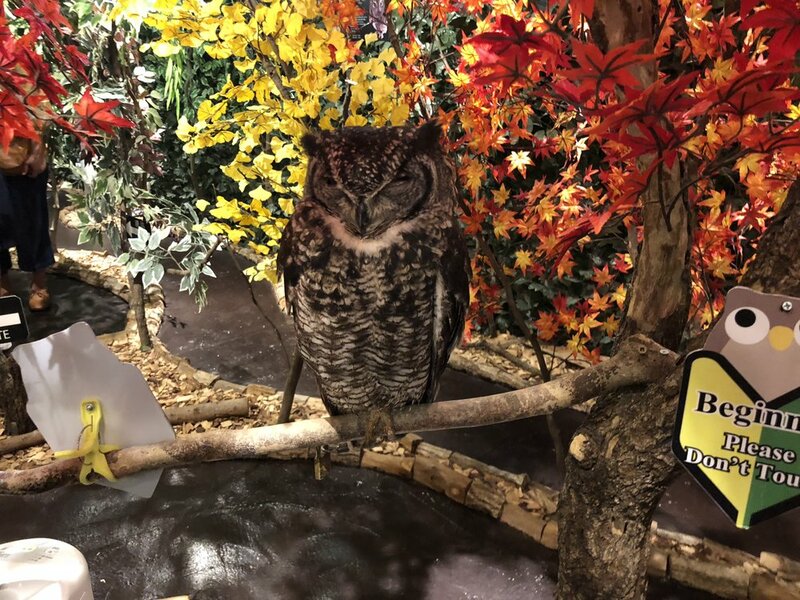 They had owls of every shape and size, and they gave you instructions about how to pet them (on the head, gently), and how to take pictures (without flash). But that’s not all we did. Right upstairs, there was a Shiba Inu Cafe, where you can pay money to go inside and cuddle with Shiba Inus, including a puppy! The drinks just come out of a sort of vending machine, but there’s a great variety, if you want to try something crazy, while surrounded by little fox-like dogs. So, when you visit Tokyo, of course you’ll want to visit the world-renowned fish market, and the Buddhist temples and Shinto shrines. But why not experience a bit of Japan’s wonky pop culture by heading to Takeshita Street and drinking beverages with animals! We’d love to send you there. Just click the button below, and we’ll get it started! hint: you’ve been doing it wrong.